Because of its specifically developed two-sided ankle support the para-trekking II qualifies for all air sports with heightened demand on the feet and the ankles, sports like hang gliding, paragliding or skydiving. The solid, closed metal eyes distribute the tension evenly over the whole shoe. The sturdy eyes of the para-trekking II prevent the shoe from unintentional opening and that way raise security. Nine eyes on each side allow for exceptional “ergonomic” adjustment to the foot. With the para-trekking II, entangling is absolutely impossible. The extra high shaft of the para-trekking II provides your foot with support and stability without restricting flexibility. Thus preventing the foot from typical sports injuries. The environmentally safe HydroGuard™ Membrane also used in golfing, with welding seams keeps the foot warm and dry. The HydroGuard™ Membrane qualifies the para-trekking II for use in air sports and in prolonged uses off road: Breathable, waterproof, heat absorbing and cold deflecting. Highest level of comfort – on land and in the air, even under the extremest of conditions. 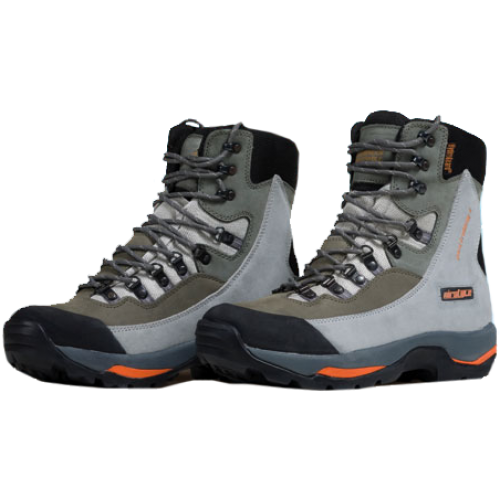 The sturdy shoelaces of the para-trekking II allow lacing for optimal fit. The top made of Nubuk leather does not only look good – it is also sturdy and provides quality and is easy to clean. The design of the para-trekking II is kept in grey tones, allows easy combinations with ones own style. Special emphasis was put on the slip resistant sole of the para-trekking II. The shock absorbent outdoor-sole offers utmost stability – even in snow and off road.